The MakerGear M2 is an excellent design for a 3D printer. The metal casing makes it sturdy and, while not oversized, it can fit in most locations by an office desk and not take up too much space. It has an excellent layer resolution and does provide some interchangeable or upgradeable parts. While the lack of color options for mutual printing is a bit of a downside, and the price is higher than others, for consumers looking to purchase a higher-end 3D printer that produces excellent single colored items, The MakerGear M2 is a solid investment. The MakerGear M2 uses a single color plastic as the print material type. It has a single color spool thread for producing the designed product, so multi-color is not an option. It also does not use the heavier material such as metal in the print production process. It uses 1.75 mm PLA plastic as the default material. Different color plastics are available for use with The MakerGear M2, although only one color can be used at a time. It is able to use ABS plastic as well. The MakerGear M2 is limited to the build area. It is not an excessively large build area as it sits at 8 by 10 by 8. It is able to print within this confined area, so anything smaller than the defined space can be produced. Should the 1K spool of 1.75mm PLA plastic be consumed during the print process, it can be stopped and refilled, so that is not an issue (as long as the same kind of plastic is used). For the MakerGear M2, the maximum X/Y movement is 450mm per second. This offers a typical print speed of 80 to 200 mm per second and a typical travel rate of 100 to 250mm per second. The extruder extrusion speed, or manual mode, has a speed of 300mm per minute, although the speed for this manual setting is going to vary based on the print settings of the software and programming connected to The MakerGear M2. There are not many accessories available for The MakerGear M2. It is pretty much as is and comes ready to use. Now, a kit version of The MakerGear M2 is available, which means some modifications can be made during the construction process, although this should only be done by individuals with experience installing and constructing 3D printers (the kit version is a few hundred dollars less, although it does require completely construction and longer configuration times). In terms of actual accessories, the nozzle can be replaced and different plastic can be used during the print job, although that is about it. There is a dual extruder upgrade option, which is the only real true hardware upgrade outside of the interchangeable nozzle. The MakerGear M2 does have two different connection options. It provides either a USB connection or an Ethernet cable connection. When using The MakerGear M2 on a network setting, the Ethernet setting is the way to go. Connecting a USB through a data hub and running it through other outlets can slow down the instructional process (although it does not hinder the quality of the print). The MakerGear M2 is made up with solid material. It is not flimsy and it can hold up well under repeated usage. This makes The MakerGear M2 a solid investment for offices looking to have a 3D printer that can weather being used on a regular basis. It does not use plastic in the construction so the metal holds up better, wears better and provides a sturdy construction. The MakerGear M2 is a reliable device and, with the print layer resolution, it does provide an improved precision over other printers on the market. Plus, for individuals who have questions as to how to use The MakerGear M2, how to set it up or they have concerns regarding the device, the company does provide excellent customer support. MakerGear understands many people have never had a 3D printer before (or at the very least have limited access to one previously), so the customer support is a nice bonus on top of the quality of the device. The MakerGear M2 is loud. It makes more noise than the average 3D printer. To some, this might be an issue while to others it might not be that much of a problem. It really just comes down to what someone is looking for and if they need something quiet or not. It does not have dual extruders. This keeps all designs at a single color unless the spool is manually removed during the print process and swapped in with a different color. For more complex color designs, The MakerGear M2 is not able to handle it. The lack of extensive connectivity options is another con. While it does provide USB and Ethernet, it does not have any WiFi or Bluetooth connections. For any office setting looking to cut cables and cord clutter, this is a bit of a drawback (although typically not a deal breaker for the quality of the prints). Several reviewers point out they had previously owed other 3D printers and how The MakerGear M2 performs far better than the other devices they have owned. Some of them pointed out the combination of resolution and quality components used in the construction of the printer is what makes it desirable. 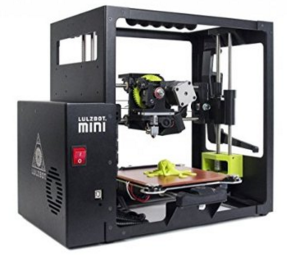 The MakerGear M2 comes in at $1,825.00. It is a higher price tag and those who are just starting off with 3D printers might be a bit put off by it. It does provide exceptional quality and layer resolution for the price, though, so it really comes down to whether or not someone wants to pay more money for a solid construction and excellent design with a higher resolution (but the lack of color diversity in the print).